A few days ago, I cracked open a bottle of Orval. Orval is one of the handful of Trappist breweries. These breweries are owned and operated by the monks who run the respective monasteries, and the beer is actually produced on the grounds of the monastery. This differentiates the Trappist beers from the “Abbey” beers of Belgium, that are licensed by religious organizations, but not actually brewed by them within their walls, or “Abbey Style” beers, which are made by commercial breweries as their interpretation of these beers. Breweries in monasteries have a long tradition, as they were often stopping points for pilgrims in Medieval times, and beer was a safe product to serve the travelers, much safer then water. The monasteries tend to be in the countryside, and each one produces products made on their grounds for sale. The money is used for charity, and the work to produce the goods are part of the structure to the lives of the monks. There is a Trappist monastery in Massachusetts that makes very nice preserves, I particularly enjoy the raspberry and the ginger. However, only in Europe does the order produce beer. The beers tend to be different, and Orval is the most different of the bunch. In Stan Heironymus’ excellent book on Belgian beers, “Brew Like a Monk” he shows a map of Belgium, and where the monasteries are located. He explains that they tended to make a beer reflecting their local style, and Orval is located in southern Belgium, almost on the French border, the home of Saisons. It makes sense, because this beer is really much more like a Saison then anything else. Lighter in color, much higher in bitterness and hop character, Orval also uses a house strain of proprietary Brettanomyces in bottling, giving the beer a hint of the wild funk that are appropriate in Saison’s. 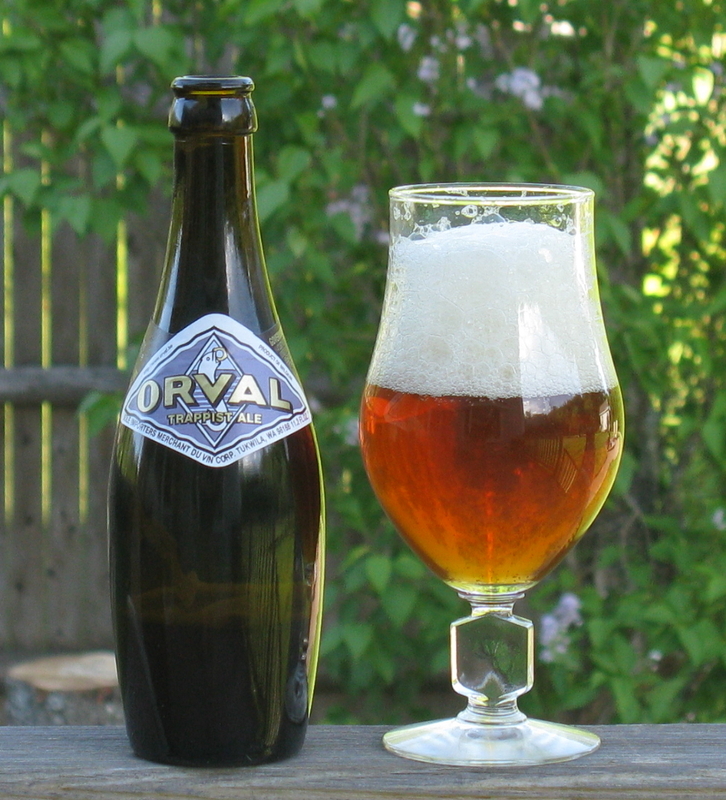 Tim Webb, a British beer write, coined the phrase “God’s Homebrew” when describing Orval, and I think that is an excellent description of the beer. It is a very dry beer, hoppy and funky. Tasting — beer is bottle conditioned, with a high degree of carbonation. Pours a slightly hazy orange color. The aroma has grassy and spicy hops at the front, with a lemony note that I think is the brett. Not really much malt on the nose. The first thing you taste is the hops, this beer is very dry, not much of a sweet malt note, more flowery hop flavors. At the end, you get hints of lemon and just a hint of the classic “funk” taste that I think is similar to blue cheese. Fairly light in body, it finishes very crisp and dry, goes down very easy. This beer is a classic for a reason. Great summer drinker, give it a try sometime as I did, sitting on the porch, enjoying a burger.